The Curt Jester has a review of the book St. Benedict and St. Therese: The Little Rule & the Little Way by Fr. Dwight Longenecker. Father Longenecker is a former Anglican who is now a Catholic priest in Greenville, South Carolina. He is author of the blog Standing on My Head. 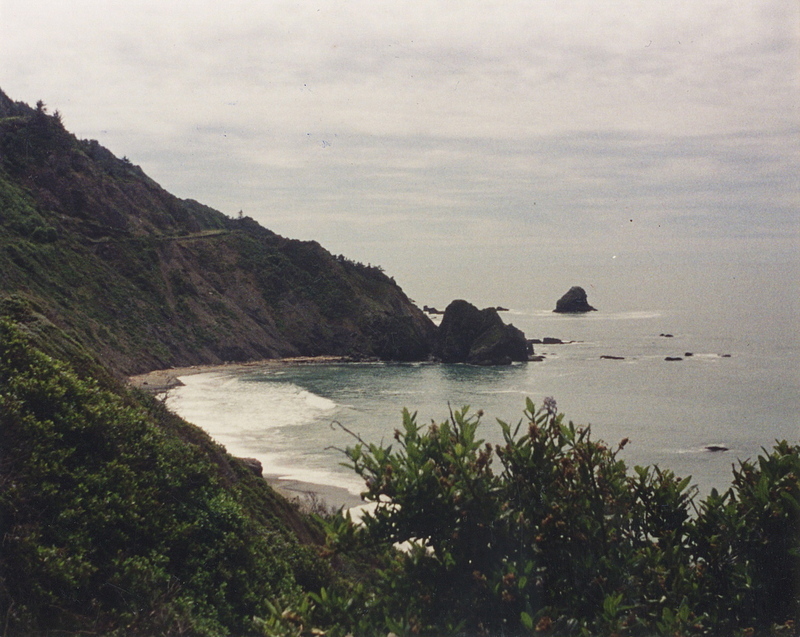 Looking for a springtime pilgrimage? Father Longenecker's blog has a link for more information on his planned group pilgrimage to the Lisieux Carmel, Mont St. Michel, Chartres, the great Benedictine abbeys in France, as well as Paris, all planned for March 24 to April 2, 2007. There is a blog category here on St. Thérèse of Lisieux that includes various posts related to her. ICS Publications has a page of books related to this saint, including their Study Edition of Story of a Soul. Ignatius Press has an English translation of Bernard Bro's biography St. Thérèse of Lisieux: Her Family, Her God, Her Message. 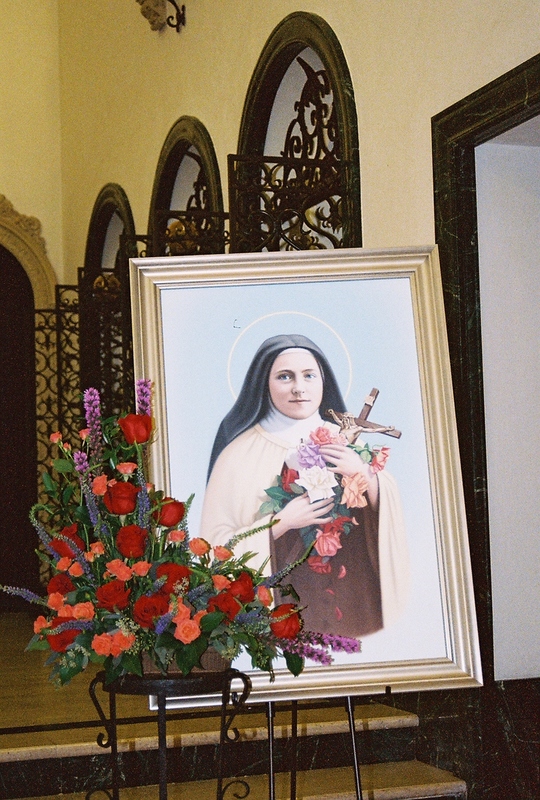 Short biographical sketches about St. Thérèse can be found at the websites of The Carmelite Order (O. Carm. ), the Thérèse 2002 website, and there is a page about her at the website alone with the Alone. Also online are Hans Urs von Balthasar's chapter The Little Way; and Chapters 3, 4, 5, and 6 of Father Marie-Dominique Philippe, O.P. 's book on Saint Thérèse. 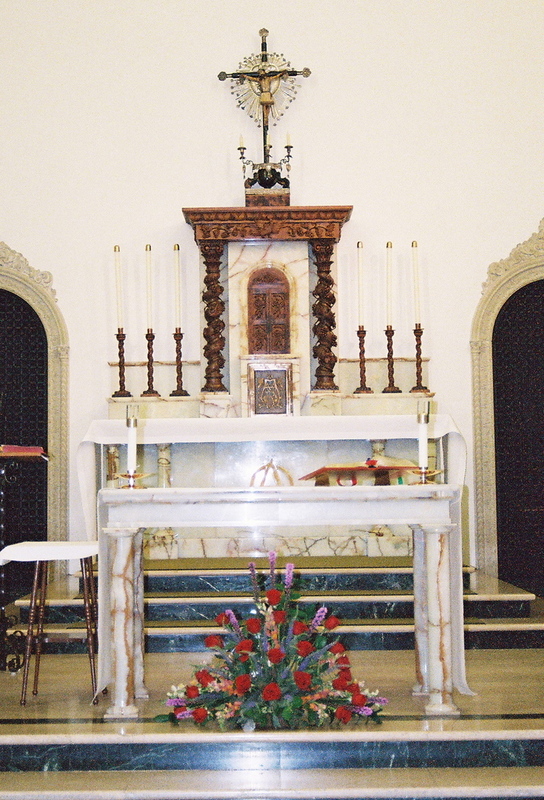 Websites devoted to the saint include sites of The Society of the Little Flower and Thérèse of Lisieux. Pages devoted to her can be found on the websites of EWTN, Catholic Online, and the Vatican. 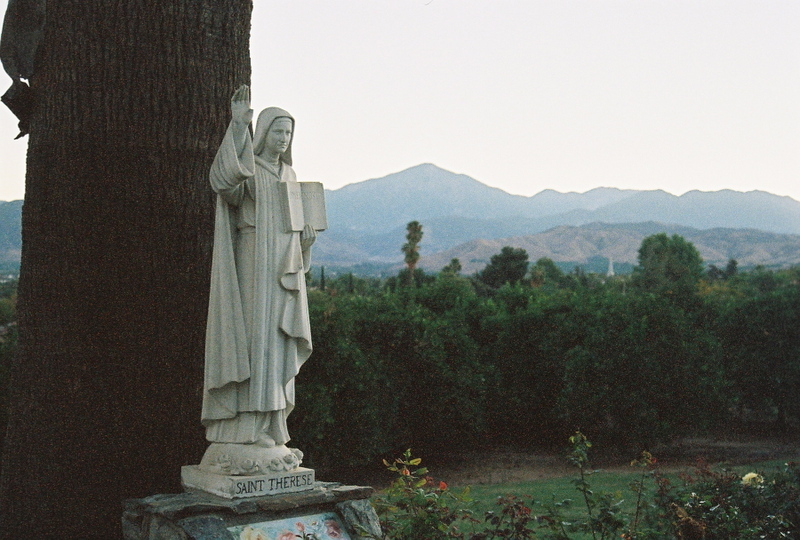 Picture: Statue of St. Thérèse of Lisieux at El Carmelo Retreat House taken at dawn. Photo by me. St. Thérèse of Lisieux: "He alone could fulfill my immense desires." A triduum for the Feast of St. Thérèse of Lisieux begins this evening. Her feast day is Monday, October 1. "Instead of doing me any harm, of making me vain, the gifts which God showered upon me (without my having asked for them) drew me to Him; and I saw that He alone was unchangeable, that He alone could fulfill my immense desires." - St. Thérèse of Lisieux, Story of a Soul. 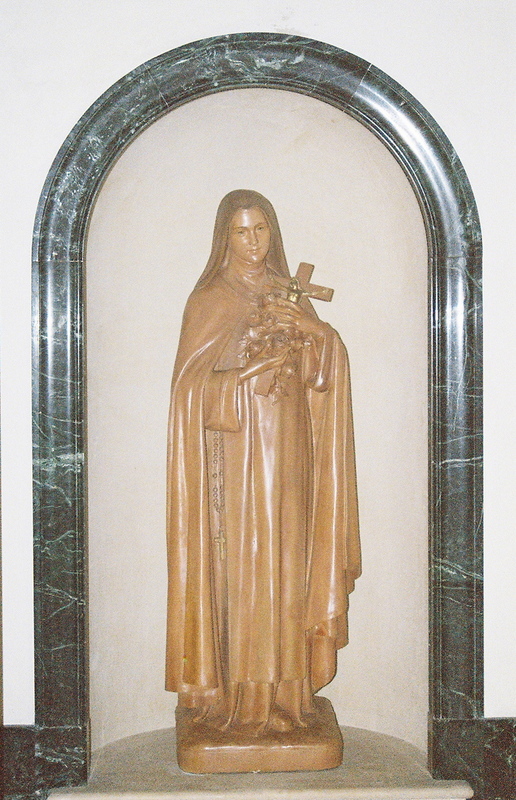 Picture: Statue of St. Thérèse of Lisieux at the Carmelite Monastery of San Diego. Photo by me. Father Zuazua discusses St. Thérèse's understanding of her contemplative missionary vocation. In so doing, he addresses Church documents about the nature of missions today, including the writings of Popes Paul VI and John Paul II and the definition of missionary activity from Vatican II: “The special end of this missionary activity is the evangelization and the implantation of the Church among peoples or groups in which it has not yet taken root.” He also discussed the missionary spirit of late 19th century France, St. Teresa of Avila's understanding of missionary vocation, and other influences on the missionary awareness of St. Thérèse. Honoring the 80th anniversary of the decree making her patroness of missions, Father Zauzua's article also provides an example through her of the missionary aspect of Carmelite spirituality today. "Thérèse [of Lisieux] begs the Father to always gaze upon her through the face of Christ, the face of Jesus. This is also a lesson for us. It is only in this light that we ought to consider the Church, the community in which we live, the family to which we belong, and ourselves. All unhealthy curiosity must disappear. Our way of seeing things, which imposes itself so easily, will disappear if we look at one another "through the Face of Jesus and in his Heart burning with Love." This is tremendous, for it entails placing our intellect at the service of divine wisdom. Christian wisdom consists in considering everything "through the Face of Jesus." 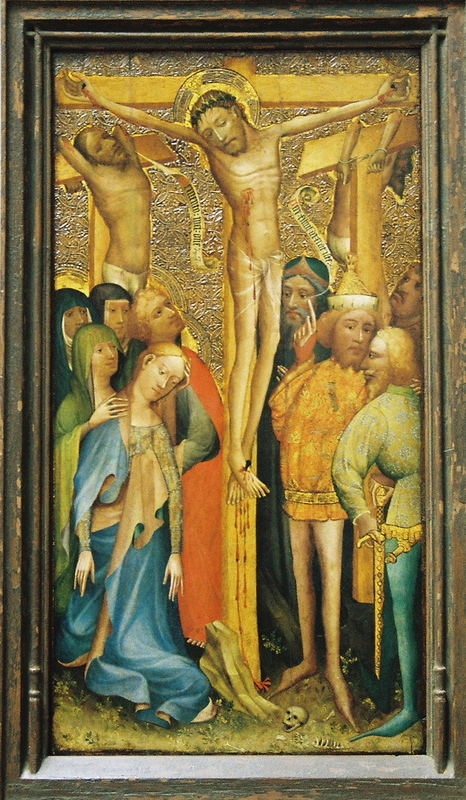 We are also "of the Holy Face" if we consider everything in Christ's gaze, and not with our own way of seeing and understanding things. This is what allows Thérèse to offer to God the holiness of Christ, to offer the "infinite treasures of his merits," in other words, the sacrifice of the Cross." - Father Marie-Dominique Philippe, O.P., Chapter 4 of "L'acte offrande" ("The Act of Offering"). Chapters 3 through 6 can be found in English translation free online here. Photo: The face of Jesus from the Spanish crucifix at Church of the Nativity, Rancho Santa Fe, California. Photo by me.